How can I export a query result to a .csv file in SQL Server 2008? This will show your query results as comma-delimited text. Right click on grid results and click "Save Results As" and save it. If your results are not in grid format, right click where you write the query, hover "Results To" and click "Results To Grid"
$AttachmentPath = "CV File location"
If the database in question is local, the following is probably the most robust way to export a query result to a CSV file (that is, giving you the most control). In Object Explorer right-click on the database in question. Select "Tasks" >> "Export Data..."
Configure your datasource, and click "Next". Choose "Flat File" or "Microsoft Excel" as destination. 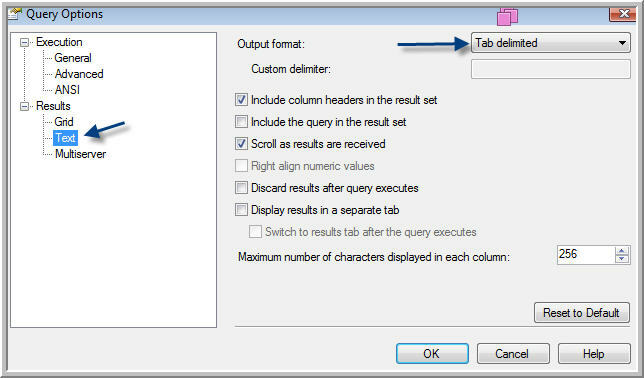 Select "Write a query to specify the data to transfer"
Paste query from Step 1. Click next >> review mappings >> click next >> select "run immediately" >> click "finish" twice. You need to have the Microsoft.ACE.OLEDB.12.0 provider available. The Jet 4.0 provider will work, too, but it's ancient, so I used this one instead. The .CSV file will have to exist already. If you're using headers (HDR=YES), make sure the first line of the .CSV file is a delimited list of all the fields. Invoke-Sqlcmd -ServerInstance Server -Database DBName -Query $qry | convertto-CSV -notype | select -skip 1  > "full path and filename.csv"
Now you can execute your query, then do a CTRL-A to select all the results, then CTRL-C to copy to clipboard, then switch to Excel 2013 (may work in 2007 too, not sure) and paste -- assuming Excel's default delimiter is set to tab. as @Slogmeister Extraordinaire Quoted is correct. Msg 7303, Level 16, State 1, Line 1 Cannot initialize the data source object of OLE DB provider "Microsoft.ACE.OLEDB.12.0" for linked server "(null)"." Msg 15281, Level 16, State 1, Line 1 SQL Server blocked access to STATEMENT 'OpenRowset/OpenDatasource' of component 'Ad Hoc Distributed Queries' because this component is turned off as part of the security configuration for this server. A system administrator can enable the use of 'Ad Hoc Distributed Queries' by using sp_configure. For more information about enabling 'Ad Hoc Distributed Queries', search for 'Ad Hoc Distributed Queries' in SQL Server Books Online. Yes, all these are possible when you have the direct access to the servers. But what if you have only access to the server from a web / application server? Well, the situation was this with us a long back and the solution was SQL Server Export to CSV. 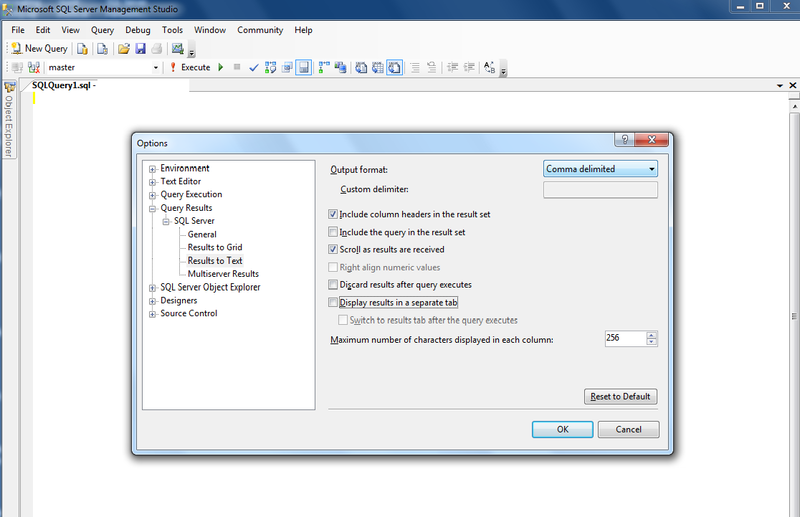 How to export data as CSV format from SQL Server using sqlcmd? SQL: How do I export a table in batches?